So, as I mentioned in a previous post, we are going at the act of teaching students to prove geometrical statements, (currently statements about congruent triangles), in a way that is new to us. We felt like rushing to the two-column proof structure was probably making things a little more confusing. Instead, we are trying to activate the students understanding on the idea of persuasive writing (although we aren’t calling it that) and letting them mess around with explaining geometric statements in paragraph or bullet point form. My fifth hour class created “proofs” in pairs from a couple of triangles. They wrote them up and posted them for a gallery walk. They then rated them by which was the best. This is one of the ones that got a lot of first place votes. The first thing that I noticed is that paragraph writing puts the thesis statement first. 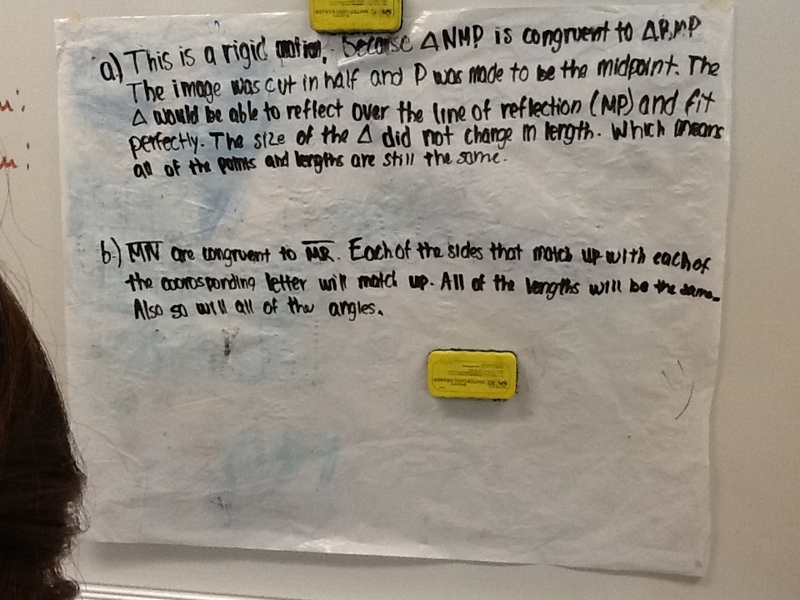 Logical, proof-based math writing leaves the conclusion for last. But, formal mathematical proofs do begin with “I will set out to prove that…” which is the logical equivalent of a thesis statement. The trick is going to be getting them to formalize their language and structure. Any thoughts? shauvera@pennfield.net. I love ideas… especially good ones.